Now win Google doodle basketball Olympic game with 36 points and 3 stars every time by using auto mouse click game cheat. Today on Aug 08, 2012 it's basketball day in Olympic so Google has also created a Google doodle on it (Google Doodle Basketball 2012). This doodle also includes a short basketball game in which you can score by throwing your ball in basket. Lastly (on Aug 07, 2012) Google had created an awesome doodle on Olympic Hurdles Race and I posted an cheat in my last post to win Google hurdles race under 4 secs today I will tell you how you can win Google doodle basketball game with 36 points and 3 stars every time without working hard on your gaming skills. In last Google doodle hurdle game I had given you a cheat to automate keyboard buttons click as this game depend on arrow button clicks but this basketball game depends on space button click (we can automate this but it includes a time interval after some time) or a mouse click after regular intervals. So to cheat Google doodle basketball game I used an Auto Mouse Clicker by which i can automatically run mouse clicks after regular intervals and in this way I can automate this game. 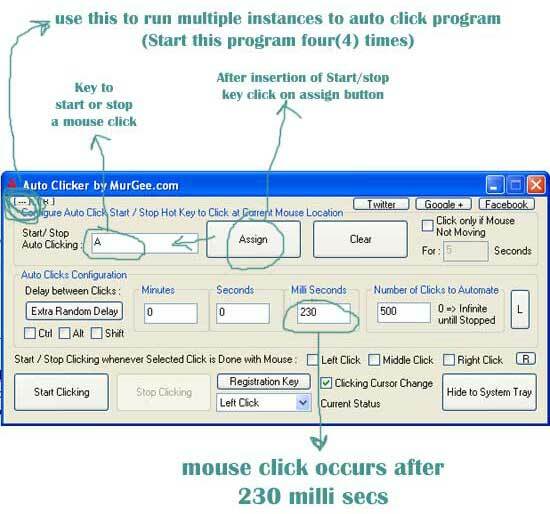 Run 4 instances of this program and assign four different values in auto click start/stop locations (A, S, K, L) and click assign every time. Now adjust time interval in every instance For "A" button instance use "230 Milli seconds", For "S" button instance use "400 Milli seconds", For "K" button instance use "600 Milli seconds" and For "L" button instance use "900 Milli seconds"
Press "A" and count for five throws as it throws 5th time in basket Press "A" again(to stop first instance) and instantly Press "S" now count for four throws and click "S" again as 4th throw occurs to stop "S" instance at the same moment press "K to start "K" Instance and count 4-4 times for both "K" and "L" instances. In next Google Doodle Slalom Canoe Olympic Game (Aug 09, 2012) you can use the same cheat script as we used in first hurdles race Google doodle. You can edit your score and stars after completing your game just right click after selecting your score digits and click on inspect elements(use Google Chrome) Now you will find a code here you can change your score and change every "hplogo_smh" with "hplogo_smg" for 3 stars. Now close your source code and capture screen shot of your screen with 100 points and 3 stars and share on your Facebook profile.